East Vancouver Unit #68 has a proud tradition of support for our veteran’s, first responders and their families and the community since opening our doors in 1930. Now 70+ year’s we continue that tradition of support not only through the standard methods like bursaries, fundraising, scholarships and poppy fund by supporting unique causes such as Citadel Canine Society and The ‘Canadian Heroes’ greeting card with proceeds going to Wounded Warriors Canada. The mission of Citadel Canine Society is two-fold: it strives to make the lives of our new veterans and first responders better, and it aims to reduce occupational stress that might have resulted from their service and Unit #68 is a proud supporter of this unique, yet vital program. by making a small donation to help pay for the cost to deliver a dog to a new veteran. 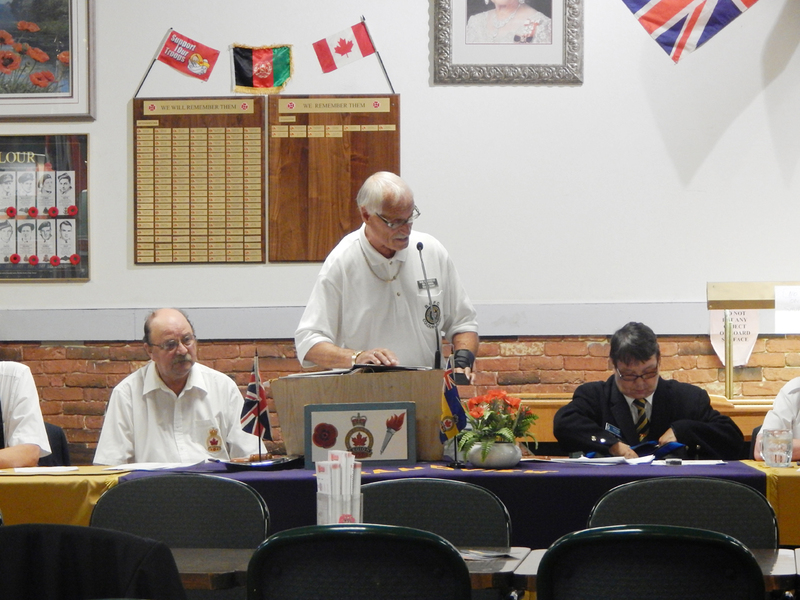 Bob Rietveld, President of Unit #68 gives a speech on the Citadel Canine Society’s PTSD Dog program to members of Legion Branch 179. 179 members subsequently donated $5000.00 towards a Citadel canine dog. Surrey, B.C.-based artist Graham Force recently produced a greeting card called ‘Canadian Heroes’ and Unit #68 is proud to support this unique artistic effort. Proceeds from the sale of this card will be donated to Wounded Warriors Canada – a national organization dedicated to funding mental health programs for our ill and injured Canadian Armed Forces members and their families. The greeting card comes with a special poem written by Michelle Jane Sales to honour soldiers from each branch of the Canadian military. Graham is hoping to raise thousands of dollars and bring increased awareness to our injured Canadian Forces men and women who now battle a different type of war at home. please help support our Wounded Warriors!